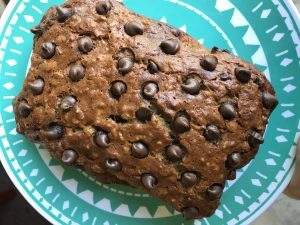 A few years back I just got so tired of throwing away brown bananas that I decided it was time I got into the banana baking game. Little secret, those brown bananas are now my favorite! 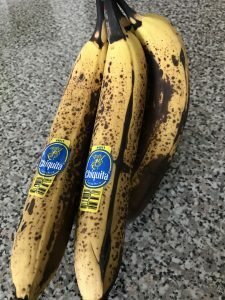 The natural sweetness they contain as they ripen is delicious, and using mashed bananas makes for a really moist bread. This recipe is all standard pantry ingredients and so easy to make. Once you’ve got the base down you can add whatever you want to it. My kids love the chocolate chips, there is just something so special about chocolate for breakfast. However in the past I have added blueberries, various different nuts, a combo of chocolate chips and walnuts is another favorite. In a stand mixer, or large mixing bowl, cream together bananas, melted butter and sugar. Add in your vanilla and egg. Then fold in remaining dry ingredients, flour, oats, salt and baking soda. 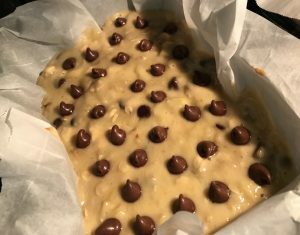 Once fully combined, add in your chocolate chips, nuts or berries. Line a small loaf pan with parchment paper, and pour in the batter. Preheat your oven to 350 degrees and bake for 1 hour. Once done lift parchment paper out with loaf intact onto a cookie rack to cool. Store in an air tight container 5-7 days , if it’ll last that long! 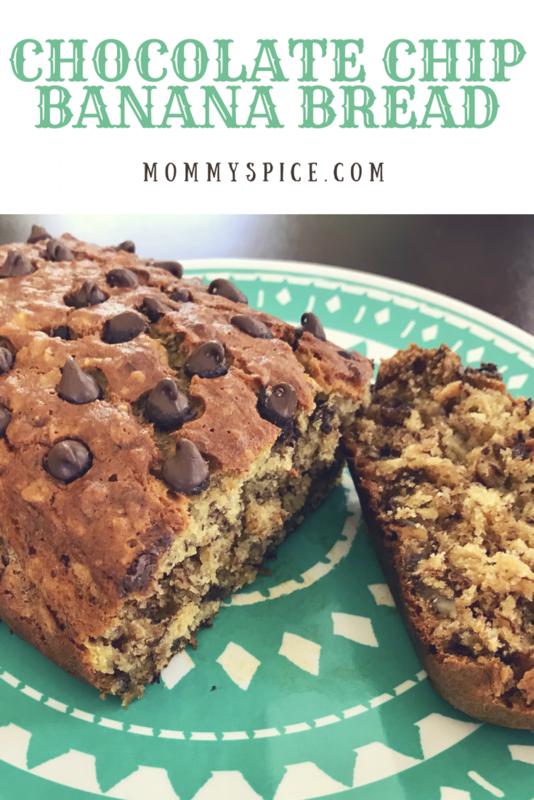 I throw this banana bread together at the most random times. Pretty much any time I already have the oven on and hot for something else I’ll go ahead and make a batch. My tip for this is to play around with the temperature at which you eat the finished product. The kids love the bread at room temperature for breakfast. I prefer to warm mine up in the microwave and have it with a glass of cold milk. My husband likes for me to cut him slices and put them in the fridge to eat the bread cold with hot coffee. Turns out there is no wrong way to eat this yummy bread!